Bridge column, March 8: How should declarer establish diamonds? In yesterday's deal, we had a race in a four-spade contract, both sides working hard to get the necessary winners. Today's is similar, but South must also know how to establish a long suit with only one outside entry in the dummy. What should he do in three no-trump after West leads the club jack and East puts up his king? Although North has only nine high-card points, he should add one for his good five-card suit, which makes his hand strong enough to raise immediately to game. Perhaps West should have led the heart two. It is often better to lead a major against no-trump when the opponents have not used Stayman or transfers. And that lead would have beaten the contract, removing dummy's entry before the diamonds could be established. South starts with seven top tricks: two spades, two hearts, one diamond and two clubs (given the first trick). Since clubs are most unlikely to be 3-3, dummy's diamonds must provide the two extra winners. But how should they be played? Since there is only one entry outside diamonds, the correct technique is to duck the first round completely, playing a low diamond from each hand. Probably East will overtake his partner's 10 and shift to the spade queen, but declarer wins with his ace and leads his second diamond, intending to finesse dummy's queen. Here, though, the king appears. 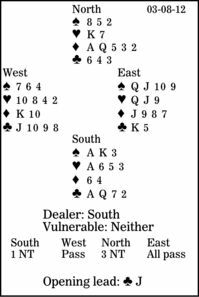 So South takes the trick with dummy's ace, cashes the diamond queen, and plays another diamond to gain nine tricks: two spades, two hearts, three diamonds and two clubs.